One of the new features that Microsoft has integrated into Windows 8 is the new Fast Startup feature that is activated by default. Windows 8 caches files on the hard drive during shutdown to speed up the start up time during the next boot. I explained the difference between shutdown and reboot before on Windows 8. When you shut down, your system makes use of the Fast Startup feature by caching data, while a reboot does not make use of the feature. Windows 8 appears to cache information about the file system and the FAT and NTFS drives connected to the PC when it prepares the system for Fast Startup. That’s not a problem if you are only using a single operating system on your computer, but if you are using a dual boot system, be it Linux or another version of Windows, you may end up running into issues. The problem here is that Windows does not recognize changes made to a partition of a connected drive. You can easily test that by shutting down Windows 8 and booting into a Linux or another Windows system on the same computer. When you write files to a partition recognized by Windows 8, and boot into the operating system afterwards, you will notice that the files are not there. Why are not they there? Because of the caching that Windows 8 does. You may now think that it is enough to reboot the system to make the files visible but that does not appear to work either. While you can make them visible by disconnecting the hard drive and reconnecting it after rebooting the system – which only works if the files are not saved on the primary partition – they are often not readable or writable. A repair of the file system may work in some cases, but it may also mean that some files will get lost in the process or at least corrupted so that you can’t use them anymore. 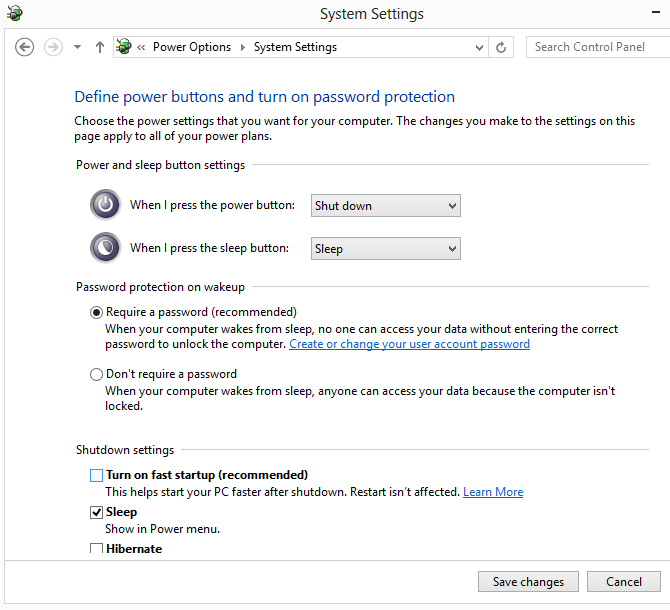 You can shutdown Windows completely with the command shutdown.exe /s /t 0 which bypasses the caching. The easiest way to use the option is to create a new shortcut on your desktop by right-clicking on it and selecting New > Shortcut from the options. Enter the command as the target and save it. A click on the shortcut from now on will shut down the computer completely so that you do not run into dual-booting issues. Enter Power and click on the Power Options result shown here. You may need to click on Change settings that are currently unavailable at the top before you can make the change. The post Windows 8′s Fast Startup does not play well with dual-boot systems appeared first on gHacks Technology News | Latest Tech News, Software And Tutorials. This entry was posted on Thursday, January 10th, 2013 at 10:36 am	and is filed under tech tips. You can follow any responses to this entry through the RSS 2.0 feed. Both comments and pings are currently closed.